Every list has has a search bar offering two options: a basic search (e.g. for a keyword) and an advanced search that allows more complicated filtering. Any searches you do only affect this Method session. If you refresh your browser or sign out and sign back into Method, your search will be lost and you will need to search again. You can save your searches, however, within a Custom Filter View. 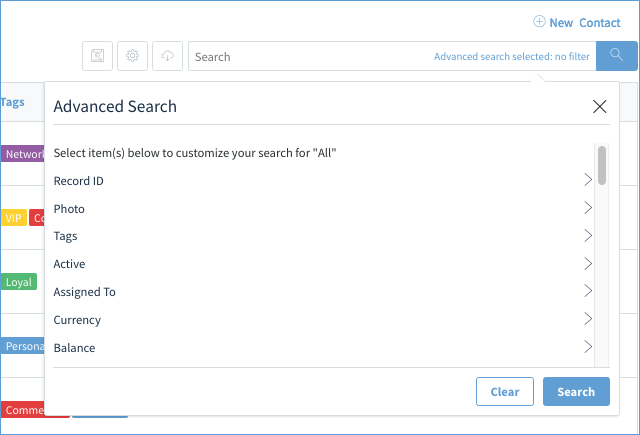 Depending on which app you're using, the advanced search offers options to filter based on the fields in the app's base table. This line shows how many filters are currently in effect. This X will close the advanced search dialog box, but will not remove the filters. These are selectable fields to add search conditions. The blue Search button will filter the grid using the search conditions you set. 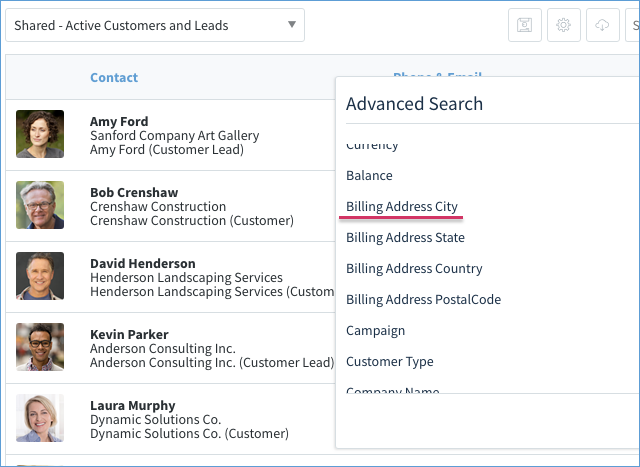 The Advanced search allows you to search through fields visible on the grid, and fields hidden on the grid. To see a listing of all fields available within the grid, click the gear above the grid beside the search bar. However, not all fields of a table are included by default in the advanced search. 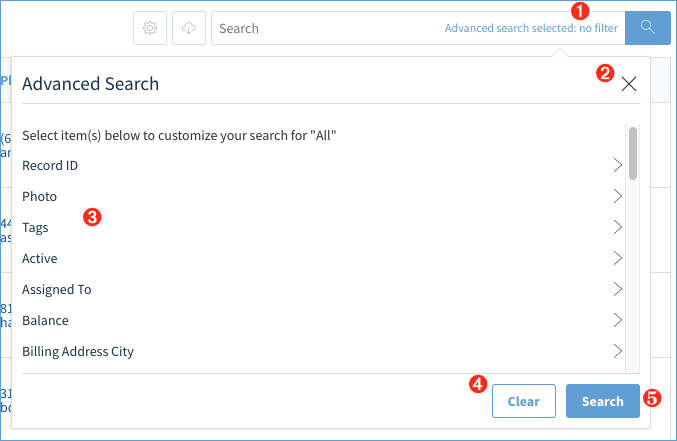 Through customization, you can choose to add more fields to the advanced search in case the fields do not show. When you select a field within the advanced search box, it will expand to show an ⊕ Add button. This condition has two boxes, a comparison and a value. By defining a condition, you can show only the records that match the condition. In the above, the comparison is set to "Greater Than" and the value is set to zero. Note the number in brackets beside Balance? That indicates how many search conditions have been added to this field. Currently, we only have one. If you were to hit the blue search button, this would filter the contacts grid so that only contacts with a balance greater than $0 will be shown. For more information on other search comparison options, see below. 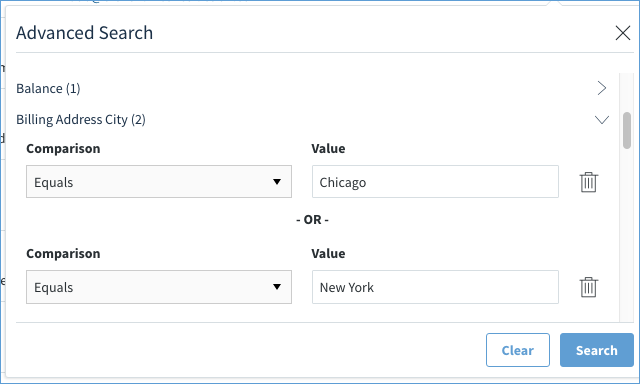 By adding a search conditions to multiple fields, you can filter the grid so that it will only find records which match ALL of the conditions. 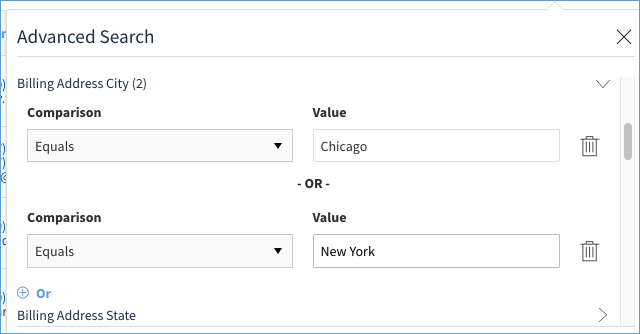 In the below example, I have added a search condition to the Balance field ("greater than zero" which is not pictured), and I have added a search condition to the Billing Address City field ("equals Chicago"). When the grid is search, only the records where both these conditions are true will be shown. So a contact must have a balance greater than zero and their billing address must be set to "Chicago". Note: You can also have multiple conditions within the same field. There is a difference here, though. Records will be shown if any one of the conditions within that field is true. In the below example, we have set up two search conditions within the same field. We are searching to see if the contact's city is either "Chicago" or "New York". So in the above example, only contacts who having their billing address set to either "Chicago" or "New York" will show. In order for a contact to show up in the grid, the contact must have a balance greater than zero, and they must be in either "Chicago" or "New York" for their billing address. However, these options change depending on the field type. 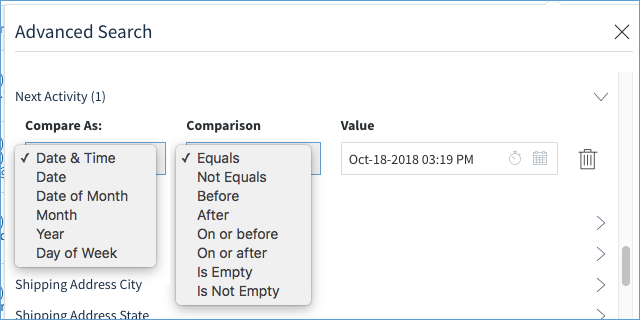 Yes/No fields will only have two selectable values to filter: Yes and No. 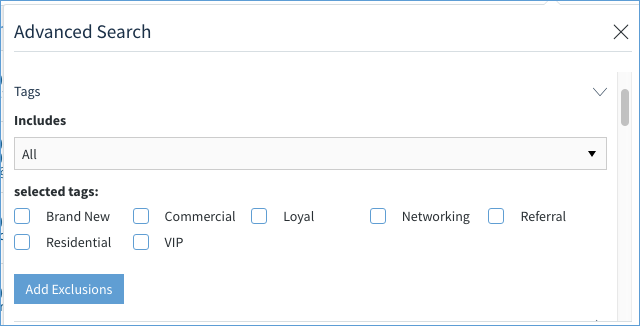 Tags field allow you to select tags to include (all or any) and exclude (all or any).